With the theme for issue two approaching 'Relationships', we caught up with the emerging creative to hear more about what they hope to achieve in the future, why they spent time scouting new emerging talent whilst at GFW and the importance of enjoying yourself on your journey into the industry. Firstly, a huge congratulations on winning at Graduate Fashion Week 2018! What award did you win? I won the ASOS Future Talent Communications Award at Graduate Fashion Week 2018. How did it feel when your name was read out? When my name was read out, it was an absolutely euphoric moment for me. John Mooney, the Brand Creative Director at ASOS who was announcing the award was teasing the winner in his speech and I was on the edge of my seat as to whether or not that was me! It was wild! As someone who is queer and non-binary and created a project and publication that was focused for our community, I was not expecting to win as I didn't think it would be something that would fit in with the more mainstream fashion publications that were also up for the award, so it was incredibly overwhelming to accept the award. Which university did you attend, and how do you think they prepared you for graduation? I attended the University for the Creative Arts, Epsom. It was the first year that we put forward for this award so we were incredibly over the moon to win the award this year, so first of all, that's an amazing accomplishment for the university and my course, Fashion Management and Marketing. For graduation and during my 3 years at UCA studying FMM, the course is incredibly realistic and practical when it comes to preparing you for the real world of work. We spend the whole three years not only honing and perfecting skills in marketing, business management, trend forecasting and most importantly, personal branding. Our 3 months in industry during 2nd year also allowed us to shape our career path and network to create connections we can use throughout the whole final year and beyond. I also want to thank them for allowing me to take my work in the final year in my own personal direction, as it was something that was new for the course and something that is usually created by Fashion Journalism or Fashion Promotion and Imaging students. Describe the inspiration and concept behind your work. 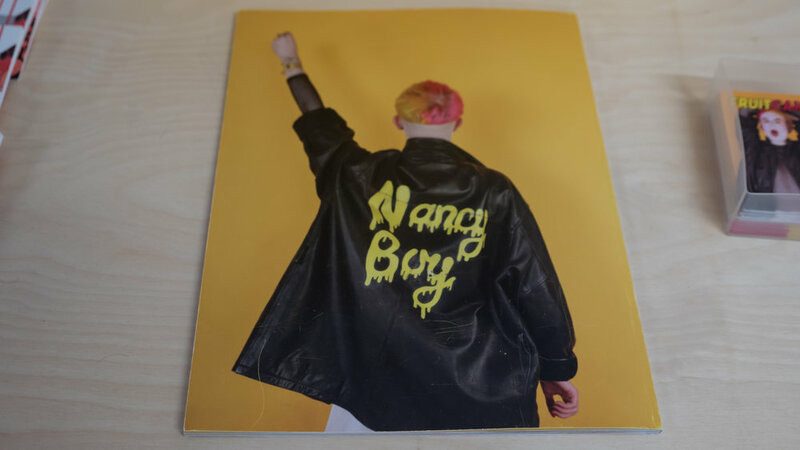 FRUITCAKE Magazine was created after spending 4 months studying the magazine market, and the social landscape and analysing the ways in which the media treated LGBTQIA+ people. I saw that there was a huge need for honest and truthful representation that was most importantly created by us, for us to consume. As someone who identifies as non-binary, I know how difficult it is to see other people talking about your life and your experiences that isn't coming from an authentic place. I describe the magazine as a curation of queer excellence, as it's full of art, photography, interviews, poetry and brand profiles on emerging talent! We want it to be a safe space for LGBTQIA+ people, and something people can pick up and read at all stages of their life and be able to relate to all aspects of the work. What one thing would you recommend our readers do whilst at the event? Scout out new emerging talent whilst at the event! The fact that all the people there exhibiting work are passionate and incredibly proud of what they're showcasing means that it's all at an amazing industry standard. It's great at whatever stage of university you're at, whether you're at uni or not, to go and see what's happening in the industry and where the industry is moving. What do you plan to pursue now, and where do you hope to be in five years’ time? At the moment I am pushing FRUITCAKE through socials and press, and really getting ready for the arrival and distribution of the final print run of issue one, as we amazingly sold out of the first print run in the first 7 days of release! Issue 2 is also in the development stages and we are proud to announce this issue's theme will be RELATIONSHIPS. We are talking to some amazingly exciting people for the next issue so we hope it can grow and grow. I am also scheduled to go and speak to ASOS after winning the award in the new few weeks to discuss the future of my publication, and hopefully begin a career with ASOS as they're an amazingly diverse and on-the-pulse brand. Whatever I do, I just want it to be powerful, authentic and for it to make me happy. If you could give one piece of advice to yourself in first year, what would it be? Have FUN! Enjoy yourself and don't put too much pressure on yourself. Try and immerse yourself in as much as possible, but always remain true and authentic to yourself. Everything will fall into place and enjoy your time at university as what you put into your work, you will get out!